ACLU Files Suit Against White House Election Fraud Commission : The Two-Way The American Civil Liberties Union charges that the commission has failed to meet federal transparency requirements, instead conducting its proceedings under a "cloak of secrecy." Kansas Secretary of State Kris Kobach speaking to supporters last month upon launching his campaign for the Republican nomination for governor. He also vice-chairs the president's election integrity commission. The American Civil Liberties Union is suing President Trump's vote fraud commission, charging that the body isn't following federal law requiring it to be open to the public. The lawsuit joins a growing number concerning the commission that have been filed by civil liberties groups in recent days. It also comes as an email was sent by Vice President Mike Pence's office to states telling them to hold off on sending voter data requested last month. Although the Presidential Advisory Commission on Election Integrity, led by Pence and Kansas Secretary of State Kris Kobach, has held only an initial meeting by telephone since it was created two months ago, that first meeting was not open to the public, the ACLU charges. "Since the [law] applies to all meetings, even telephonic meetings, the commission has already violated [the Federal Advisory Committee Act]," ACLU staff attorney Theresa Lee tells NPR. The commission is planning a meeting on July 19 that would be available to the public only by video link. However, that doesn't count as "open," Lee says, "because it does not provide the opportunity for sufficient public oversight as required by law, and is notably inaccessible to any citizens without a computer and a broadband internet connection." The ACLU's suit, filed in the U.S. District Court for the District of Columbia, is similar to another one filed Monday by the Lawyers' Committee for Civil Rights Under Law. At least two other organizations, the Electronic Privacy Information Center and Public Citizen, are also suing the Trump administration over alleged violations of privacy resulting from the commission's efforts to collect voter data. Last month, the commission sent a letter to all 50 states asking for detailed voter registration data as part of its investigation. More than a dozen states have refused to comply. Many of the rest have said they can't provide all the information requested because of state law. The deadline for the request had been this Friday, but according to NPR's Pam Fessler, an email sent Monday by Pence's office in response to EPIC's request for a temporary restraining order advised secretaries of state to hold off on handing in the controversial data until a judge rules on the matter. The Kobach commission was created by the White House to investigate what Trump says was widespread vote fraud in the 2016 election, causing him to lose the popular vote to Hillary Clinton. No evidence has been asserted to support that claim. From the outset, the ACLU has been highly critical of the commission, among other things, accusing Kobach of being unfit to lead it. The controversy prompted a tweet from Trump suggesting the data may show irregularities. 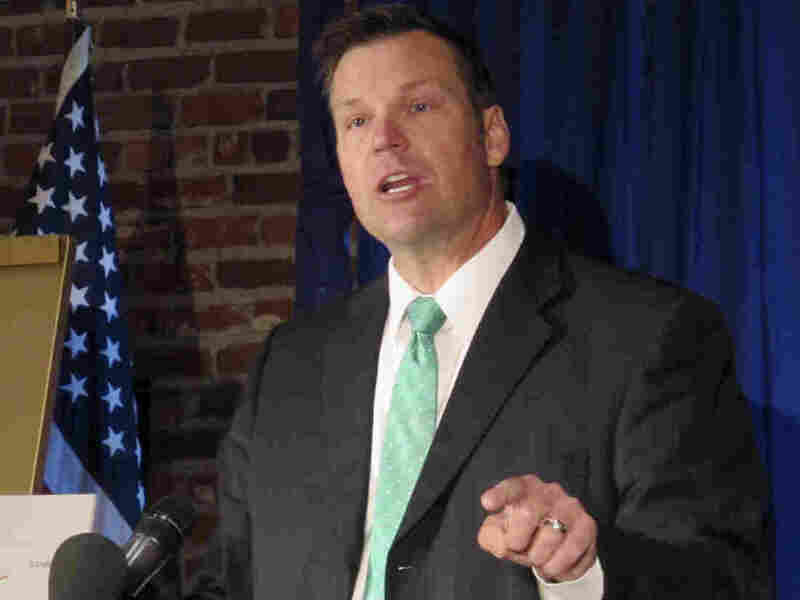 Kobach last week fired back, accusing the media of exaggerating the number of states that had resisted handing over the information. "Despite media distortions and obstruction by a handful of state politicians, this bipartisan commission on election integrity will continue its work to gather the facts through public records requests to ensure the integrity of each American's vote because the public has the right to know," Kobach said.